New York City, NY - Philippines #1 Dennis Orcullo, a former World Champion, will be joining compatriots Warren Kiamco and Roberto Gomez for Asia's first gold at the historic Andy Cloth 75th World Tournament of 14.1 . The main event will take place once more in New York City. Dragon Promotions is pleased to keep the oldest billiard event in the world alive with the 75th production on July 13th-19th, 2015. As usual, a star studded field is expected this year at Steinway Billiards Cafe, who is once more hosting this world class event. The World Tournament Official Equipment include Viking Cue with all matches played on Andy Cloth. Event partners include Mr.Tom Gleich, Dr. Gregory Diehl, Mr. Greg Hunt of Amsterdam Billiards, & Mr. Jim Gottier of Greenleaf's Pool Room. Patron sponsors include Mr. Harold Siegel of Excelsior Graphics, Dr. James Heller, Mr. Charles Eames of Charles Eames Photography, Frank Scharbach of Frank's Billard Cafe, Focused Apparel and the National Amateur Pool League. The World Tournament will be live streamed on AZBTV , order by going to www.worldstraightpool.com . Official media partners are www.NYCGrind.com , Pool & Billiard Magazine, & tech support by Gotham City Technologies. This trio of Filipino champions will seek to make history for Asia. 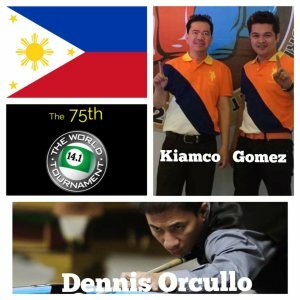 Former 14.1 Bronze medalist Dennis Orcullo, Quarter-finalist Warren Kiamco and debut of World 9-Ball silver medalist Roberto Gomez will seek to unseat the Europeans & Americans and do what no Asian has done before in 102 years : Become World Straight Pool Champion. Orcullo came close with a bronze in 2007, with Efren Reyes and Francisco Bustamente both receiving silver medals in other attempts for the elusive gold. No other Asian country has had as much success as the Philippines. Each of the three players will have to play 6 matches each in the first stage of the championship. If they qualify in their respective groups, they advance to a double elimination knockout stage. If they advance again, they qualify for the final stage of 16 players in a single knockout stage, but with longer match races. The finals will be a race to 300 balls made first, which could take as long as 6 hours. 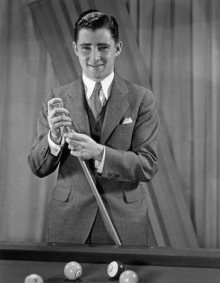 Mosconi won the World 14.1 seven times, which remains the second highest wins in history.